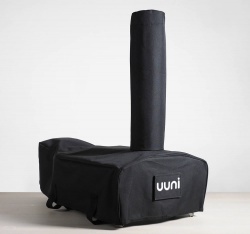 Uuni / Ooni 3 is the definitive tool for your garden or outdoor kitchen. It’s designed specifically to take the cost, bulk and hassle out of using a wood-fired oven. An evolution of the highly acclaimed Uuni 2S, Uuni 3 reaches 500°C in just 10 minutes and can cook an authentic wood-fired pizza in an incredible 60 seconds. The patent-pending oven runs on wood pellets which are very energy-dense and inexpensive. Uuni is powered by wood pellets which are very energy-dense and cheap; they’re like regular wood except compressed. No additives, no hidden extras. Just wood. 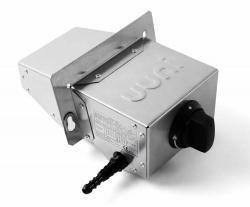 The pellets ignite easily & Uuni takes just 10 minutes to heat up, from cold to 500˚C / 932°F. • Materials: 430 stainless steel, stainless steel rivets, FSC certified wooden handles, cordierite stone baking board.